One, the Secretary of Steak believes all friends, coworkers, and strangers must come together over copious amounts of the glorious beast. Two, cigars are a perfect accompaniment to smoke together and tell stories. Three, when in the company of cigars, beef, and friends, we raise glasses and toast each other’s accomplishments. Four, friendships both personal and business are the natural greatness of this club. While this club is called The Red Meat Lover’s Club, the real name should be “Steaksmen” because we have one common goal…to make sure we are stronger as a group. We exist to exalt the act of gathering, dining, and ensure that we are the best business dining club in the country. Every “meating” is a curated experience that no one else can have besides our “steaksman”. This club is a lifestyle that can only be shared with similarly visioned members. We have the desire to beef, drink, some and laugh. This is the core of our existence. In 1994, Evan Darnell, AKA “The Secretary of Steak” was dining in the main hall of Tulane University and saw a sign on dining room table that said “S.A.V.E”: Students AdvocatingVegetarian Eating. He knew there must needed to be an opposing club and formed the Red Meat Lover’s Club. Monthly “meatings” were held in various local bars and the Pike fraternity house.Upon Evan’s graduation, the membership reached 300 members. 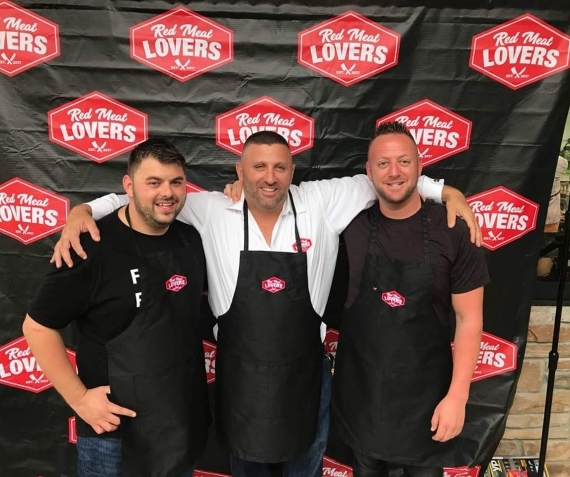 After moving to Florida in August 2017, Evan took his beloved club out of hibernation and re-established The Red Meat Lover’s Club. Now, not much has changed except we have the ability to create bigger, more dynamic events with a dynamic core of “Steaksmen” who love to feast on the glorious beast. The RMLC is based out of sunny South Florida with its eye on establishing chapters where groups of “Steaksmen” have a thirst for old brown spirts, a yearn for the glorious beast, and the want to establish strong personal and business bonds with each other. Welcome to Psycho Foodie where psychosis and food become ONE!